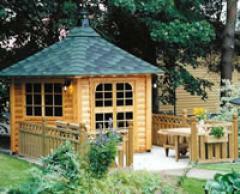 At Allington Nurseries, we are the agents for the BBQ House Company with everything for the Garden BBQ House and more. Even in our climate we can BBQ in any weather or time of year with the luxurious BBQ Houses that we can offer. Please call us for further details or a free brochure. Free Quotation without obligation. The perfect family sized barbecue house. This will seat 12 people comfortably and will sleep 3. 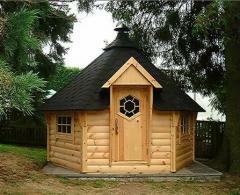 The building is manufactured from the finest redwood forests of Estonia. The 6 walls are 45mm thick (nearly 2inches). The windows are all double glazed and fitted with high quality brass finished fittings. 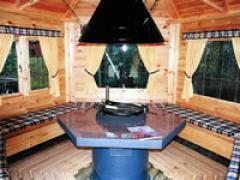 The inside has benches fitted to 5 walls, these convert to 3 sleeping platforms when needed. 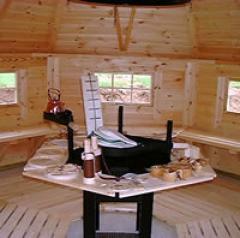 In the centre of the Barbecue House there is a specially designed circular barbecue with removable tables. There are 3 adjustable, rotating cooking platforms for holding the kettle, saucepan and frying skillet over the charcoals. There are also 2 Blaze boards which are used for cooking a side of salmon or trout. Other accessories included are: 5 Reindeer Hides, wooden plates, knives, forks, large and small wooden mugs, clock, guest book, bottle binoculars, trivet, napkin holder, thermometer, and oven gloves. Call us for a FREE quotation or more information today. The ideal house for entertaining a large number of people. This will sit 18 and sleep 3. The building is manufactured from the finest redwood forests of Estonia. The 8 walls are 45mm thick (nearly 2inches). The windows are all double glazed and fitted with high quality brass finished fittings. The inside has benches fitted to 7 walls, these convert to 3 sleeping platforms when needed. Other accessories included are: 7 Reindeer Hides, wooden plates, knives, forks, large and small wooden mugs, clock, guest book, bottle binoculars, trivet, napkin holder, thermometer, and oven gloves. 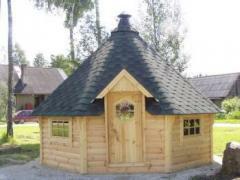 We are confident enough to say that there is not a summerhouse in the UK to compete against this one. It is totally unique. This building comes in two sizes, 9m² and 12m². 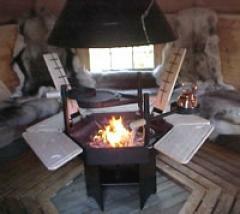 The inside is decorated with curtains and cushions instead of Reindeer hides. There is the same barbecue as in the other buildings. If you wish to be really decadent, it is possible to have a different barbecue made out concrete and finished on top with polished granite tiles. This is the ultimate barbecue table. There are 2 windows that open on the Victoria summerhouse; these are opposite the double doors. The rest of the walls have double glazed window panes so you get a 360º view. Accessories: Circular barbecue with tables, smoke hood, kettle, cast iron frying skillet, wooden plates, knives, forks, large and small wooden mugs, trivet, oven gloves, bottle binoculars, cushions and curtains.